Your cervical spine (neck) consists of seven small vertebrae that are responsible for holding the weight of your head, while remaining flexible enough for it to move in many directions. A human head weighs 12 pounds on average, which is a lot for such a small structure to be responsible for; this makes the cervical spine prone to injury and pain. 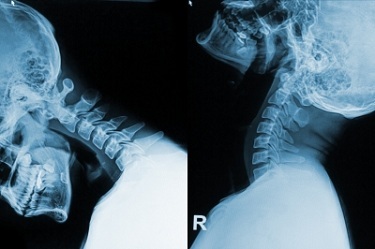 Whiplash injuries (a sudden back and forth “snap” motion of the neck) are very common. However, there are many less obvious causes of injury and discomfort in this area of your spine. Simply aging can lead to pain in the neck due to disc degeneration, stenosis (narrowing of the spinal column) and osteoporosis. Daily stress can also increase cervical pain from tight muscles caused by sitting too long, obesity and poor posture. These are just a handful of factors that can lead to pain and other symptoms in the cervical spine. What all of these factors have in common is that they contribute to subluxations, or misalignment of the tiny vertebrae that form your cervical spine. When any portion of your spine is out of alignment it can lead to a whole host of maladies, including pain and discomfort. In the neck, it can cause numbness of your extremities, severe headaches and more. Your doctor of chiropractic will perform a detailed analysis of your situation, including questions about when and how the pain started. They will also assess you physically to create a care plan to help relieve your neck pain. This care plan will be centered on targeted adjustments in your neck to re-align any vertebrae in question. You may feel relief right from the first adjustment since this practice removes nerve interference that can be causing pain. Your care plan may also include home exercises to maximize your health. The bottom line in chiropractic is this — removing subluxations also relieves nerve interference. Chiropractic Lifecare of America can save you up to 50 percent on chiropractic visits. Call 800.775.7900, or contact us today for more information about how chiropractic care for neck pain might be a viable option for you.